Seven jihadists have been sentenced to life in prison in Tunisia over gun and grenade attacks at a museum and a beach resort in 2015. Sixty people, mostly tourists, died in the attacks and many were wounded. Other defendants received lesser prison terms, but 27 were acquitted. The first attack on the Bardo Museum in Tunis in March 2015 killed 22 people. 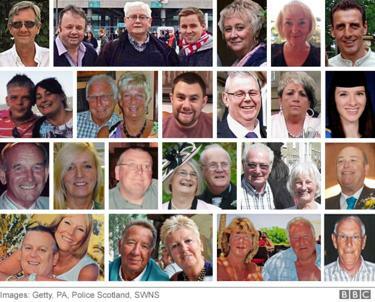 Three months later, 38 tourists, most of them British, were shot dead at Port El Kantaoui near Sousse. Among the dead in the beach attack were a 24-year-old beauty blogger; a 49-year-old man, his father and his nephew; and several couples on holiday together. The man believed to have masterminded both attacks, Chamseddine al-Sandi, remains on the run, but there are reports that he was killed in a US air strike in Libya. Two separate trials were held over the attacks, which Islamic State militants said they had carried out. Three gunmen – two in the Bardo attack and one in Sousse – were shot dead at the scene. In the Sousse trial, four militants were given life sentences, while five others were sentenced to between six months and 16 years. A further 17 were acquitted. Three Bardo defendants also got life terms and a number of others were jailed for shorter periods. At least 10 were acquitted. A state of emergency has been in place since the attacks. Tunisia’s already faltering tourism industry was badly hit, but it has shown signs of recovery in the past year with travel bans lifted by several countries, including the UK – as tour operators return. There has been considerable progress in combating jihadists in Tunisia thanks to concerted international help, BBC Middle East analyst Sebastian Usher says. But they still pose a potent threat, he says, while the endemic problems of chronic unemployment and lack of economic opportunity persist.